Austin Tennison is a 23-year-old happy and loving individual who always has a smile on his face. Austin was born with a severe form of cerebral palsy and spastic quadriplegia, described by the impairment or loss of motor function. Cerebral Palsy affects body movement, muscle control, coordination, muscle tone, posture and balance. In Austin’s case, it has had an impact on his fine and gross motor skills and oral motor functioning. As a result, Austin requires a wheelchair for mobility and assistance with activities of daily living. 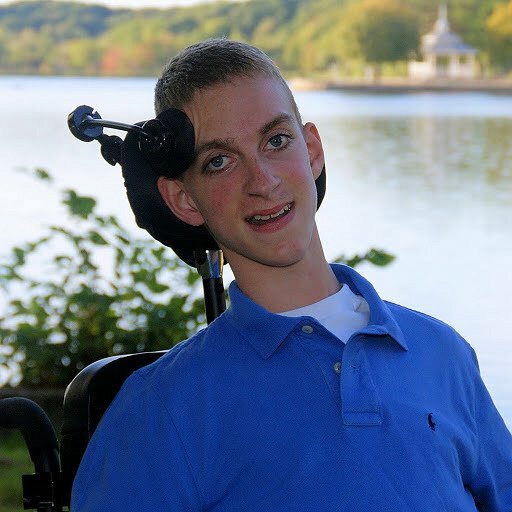 Throughout his life, Austin has required specialized care, medical equipment and extensive physical therapies and rehabilitation. He needs a wheelchair and specialized vehicle to get around, and is unable to move independently or eat and bathe on his own. In 2011, Austin required a spinal fusion surgery in which rods to support his spine were implanted. Then last year, Austin was diagnosed with osteoporosis. He desperately needs the appropriate supportive intensive exercise program that is specifically suited for his delicate and fragile medical condition. Despite facing many obstacles, Austin has a large circle of friends and family and he loves to remain social within his community. He was referred by his physician to a promising exercise program known as Journey Forward (JF), (www.journey-forward.org). Austin was part of a Fox news story back in March of 2016 which featured the founder of JF, www.myfoxboston.com JF allows him not only to get a great physical workout, but to spend time with peers with similar disabilities. Austin is proud to report that he was STANDING at his very first session at Journey Forward! His response to the program offered at Journey Forward has been overwhelmingly positive, and Austin feels the benefits are far greater than any occupational or physical therapies he has tried in the past. Journey Forward is unique and one of the only places with specialized equipment and trainers considering his challenges. Over the past year alone, Austin has celebrated many accomplishments through JF. Specifically, he’s been able to hold himself up for over a minute with no assistance, can bear his on weight with minimal help, and perform squat-like exercises all on his own. This progress has been invaluable for Austin. Unfortunately, each session at Journey Forward costs $200 and Austin’s health insurance does not cover this program. Austin’s goal is to attend these sessions twice per week for 2 hours each. These out-of-pocket expenses are greater than what Austin and his family can handle alone, but the results and spending time with people facing similar challenges to Austin are invaluable. Austin is reaching out to his family, friends and community to help subsidize the cost of Journey Forward, as well as his out-of-pocket medical expenses. Without your financial support, Austin and his family are unable to afford this much needed program which will improve his quality of life. To help offset such expenses, a fundraising campaign in Austin’s honor has been established with Help Hope Live, a trusted nonprofit organization that has been providing community-based fundraising guidance to patients and their families for more than 30 years. All donations are tax-deductible to the full extent allowed by law, are held by Help Hope Live in the Northeast Catastrophic Illness Fund, and are administered by Help Hope Live for illness-related expenses only. To make a donation, please click on the yellow DONATE NOW button. For more information, please contact Help Hope Live at 800.642.8399. Thank you for your support! Thank you to every one from the bottom of hearts. We raised an amazing $11,000 from the Wiffle Ball event yesterday. It was a huge success. Perfect weather and everyone had a wonderful day. We could not have done it without the support from all of Austin’s family and friends. We are already looking forward to next year’s event. To learn more about Austin’s treatments, please visit www.journey-forward.org. Glad I was able to access your bio and get some more specifics on your situation. Thanks for letting me into your life. It has been an honor and privilege to be part of your life. I look forward to continuing our friendship over the coming years. Hope you enjoyed the baseball tapes!